Each spring thousands of people will descend on downtown Tempe to enjoy Hawaiian food, traditions, and culture at the Arizona Aloha Festival. There are several stages of live entertainment, including music, dance, and lectures of Hawaii and Polynesia. The Island Marketplace is huge, with vendors offering traditional crafts, fresh flower leis, baskets, hats, carved bone necklaces, and tapa cloth. There are island wood products, Hawaiian jewelry, surfer shorts, Hawaiian coffee, and Hawaiian music. The food court offers traditional American snacks, but don't miss this chance to sample some of the favorite foods of the people of Hawaii and the South Pacific, like kahlua pig, manapua, haupia, Vilo Vilo chicken, or Spam musubi. Children can make island crafts to take away. The Ukulele Corner is where local ukulele players congregate to jam, and where experienced players share the joy with those who want to learn. The festival takes place in mid-March. Specific dates are usually announced by the previous year's end. The Arizona Aloha Festival takes place at Tempe Beach Park. Tempe is located in the East Valley. You can check how long it should take to get there from other parts of town. 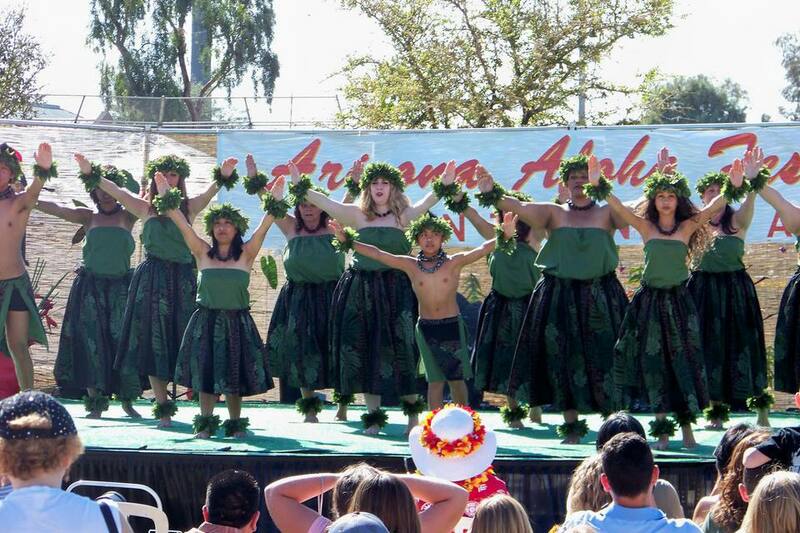 You don't need tickets, because admission to the Arizona Aloha Festival is free for everyone. Plan ahead for light rail access or parking in downtown Tempe, depending on your transportation needs. You can stay at hotels that are within walking distances from a light rail station and take the light rail to the event. If you want to be closer, about 1/2 mile away, I recommend Tempe Mission Palms. If you are going to the Arizona Aloha Festival, be prepared. It is one of the more popular two-day festivals that takes place in the Phoenix area. Driving around in downtown Tempe can be a challenge on a normal day, so take a little extra patience with you on Arizona Aloha Festival days if you intend to drive. The Arizona Aloha Festival is a very popular event. It will be crowded. Seating at the main stages at the Arizona Aloha Festival is at a premium. If you will need to sit down to rest from time to time, you might want to bring a small folding chair with you. Bring cash for food and snacks. Cold water and soft drinks are available at reasonable prices. As usual, on a Tempe spring day in March, sunscreen, hat, and sunglasses are in order. For more information, contact the Arizona Aloha Festival at 602-697-1824 or visit Arizona Aloha Festival online.